I've implemented a new plugin for Crunchy which may be of interest to some: a reStructuredText editor with live preview inside the browser window. Each time a key is pressed in the editor (html textarea), an ajax request is sent to the Python backend with the entire content of the editor. This is processed by docutils with the result sent back to the browser as a full html page displayed inside the browser as illustrated below. I expected this to be slow (make that very slow) and for the first prototype I wrote, I only sent the ajax request when "enter" was pressed. After playing with it for a while, I realized that there was no need for this. If you type fast enough, the previewer does not keep up for each key press, but this does not hinder in any way the speed at which you can enter text in the editor. By the way, the editor (html textarea) can be converted into a true embedded editor which can save and load files, etc. 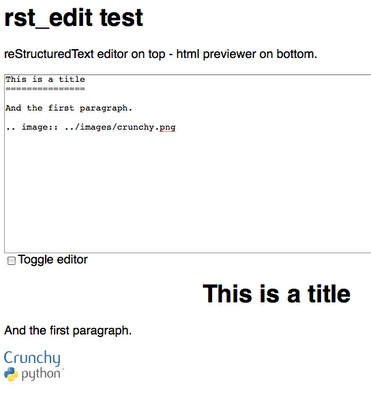 - otherwise, it would not be a very useful tool for working with reStructuredText documents. When doing so, the live preview is turned off. I've also included the possibility to save the html file produced so that one does not have to invoke docutils separately. And this also incorporates the two custom directives (crunchy and getpythonsource) used by Crunchy and crst2s5. This is included in the newest release (1.1.2) of Crunchy. In a few months, many pythonistas will be converging to Atlanta to take part in the next Pycon. I'm hoping to be able to attend it as I have been really inspired by the many people I met in two previous conferences. While I most likely won't be presenting anything this time, I thought I would try to contribute to some presentations in an indirect way. While I, of course, approve of any positive support of Crunchy, I had to admit to myself (and mention in a subsequent comment) that Crunchy was really not up to the task - at least not yet. I would have hoped that a CSS-based slideshow by the king of CSS would be a shining example of how information could be cleanly authored and then sparklingly displayed. S5 seems to miss this mark, especially since there don't seem to be many themes available for it, another surprise given how CSS should have made it accessible to lots of designers. Also, although (or perhaps because) the format is native to the web, it's not possible to get the slides as illustrations. produce html files - thus easy to post and share -see link above. use well known S5 slides (version 1.1 designed by Eric Meyer) to switch between "full paper"/slides. It is possible to include extra notes in the "full paper". like most (all?) slide-based presentation, content on one slide is limited to a given number of lines ... which makes it ackward to show long-ish code samples. as Ned Batchelder alludes to, the automatic scaling done by S5 often yields unsatisfactory results in terms of line spacing, etc. rst2s5 is based on S5 version 1.1. A new version (1.2 alpha) is available which addresses some of the shortcomings of version 1.1 with the addition of speaker's notes which are in a separate window (e.g. on the laptop screen) while the slides themselves are in a different window (which can be on the projector) with the two synchronized. at ShowMeDo from the Python category.